New Delhi, Aug 10, 2018 : The Supreme Court has admitted the CBI’s appeal against the acquittal of Rajesh and Nupur Talwar in the murder of their daughter Aarushi Talwar and help Hemraj in 2008. The court has also issued notice to the dentist couple, who were freed in October last year. Hemraj’s wife Khumkala Banjade was the first to petition the court, saying the Talwars had been wrongly acquitted. 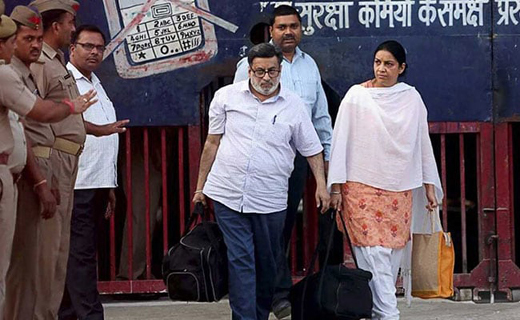 On October 12 last year, the Allahabad High Court said there was no evidence that the Talwars were guilty of the double murders at their home in Noida. The Talwars were freed after four years in jail. A CBI court had convicted the two in 2013 and they were sentenced to life in jail. The CBI had said in its petition that the court decision was wrong on "many counts". Aarushi, 13, was found with her throat slit in her bedroom. A day later, the Talwars’ domestic help Hemraj, who was from Nepal, was found on the roof of the house. The Talwars have denied that they murdered their teen daughter and assert that they are victims of a botched investigation and unfair media coverage. Investigators say the double murder was an inside job because the apartment had not been broken into and the "last seen" principle indicts the Talwars because the victims were in their presence before they were killed.